Here lives the History of MotorBikes. Historic Motorcycle Club “Cascinetta” Gallarate is firmly linked to the history of Italian motorcycling, a reference point for fans of motorcycling and the History of cycling headquartered in Via Ristori , 2 in Gallarate, in the district of Cascinetta. Racing section was born in the Fifties with the earliest organisation of the legendary Motorcycle club’s Race Meeting, a citizen circuit developed in Gallarate, when many factories producing bike started to operate in north Italy, like Benelli, Gilera, Guzzi and MV Agusta. 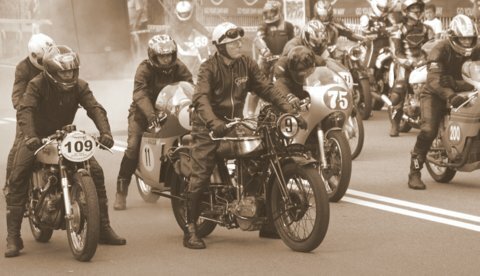 It was this Club that organized the famous street circuit that between 1954 and 1971, brought the first races of the Italian Championship in the area and it is this same association that keeps alive the memory of those days, organizing every two years the famous Historical Commemoration of the City Race Circuit. 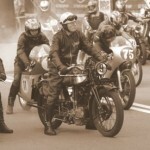 Today we like to present it as a Motorcycle Club of both rich sporting tradition and shared affinities. It brings together a close-knit group of friends and motorcycle enthusiasts in general. In the footsteps of history, we can retrace today’s enthusiasm for two wheels, represented in an emotional connection, synonymous with freedom, sports, travel, in a word … emotion. Our emblem symbolises this combination of values: The year of foundation, next to the Italian flag overlaid on the seal of the checkered flag, is a testament to the tradition of street circuit; as the Latin aphorism ” Motus Vivendi ” expresses our desire for change, for transformation, for growth, hoping it is a good symbol to bring new friends to the club.